Anticonvulsant activity of a nonpeptide galanin receptor agonist. Galanin is a neuropeptide with a wide variety of biological functions, including that of a strong endogenous anticonvulsant. No nonpeptide ligands, capable of activating galanin receptors, are available today. Based on known pharmacophores of galanin, a combinatorial library was designed, synthesized, and screened at the rat hippocampal galanin receptor. A low molecular weight galanin receptor agonist, 7-((9-fluorenylmethoxycarbonyl)cyclohexylalanyllysyl)amino-4-methylcoumarin (galnon) was found to displace (125)I-galanin with micromolar affinity at Bowes cellular and rat hippocampal membranes. Autoradiographic binding assay on rat spinal cord sections confirmed the ability of galnon to displace (125)I-galanin from its binding sites. Galnon inhibited adenylate cyclase activity, suggesting an agonist action at galanin receptors. When injected i.p. galnon reduced the severity and increased the latency of pentylenetetrazole-induced seizures in mice and reversed the proconvulsant effects of the galanin receptor antagonist M35, injected into a lateral ventricle. Intrahippocampal injection of galnon also shortened the duration of self-sustaining status epilepticus in rats, confirming its agonist properties in vivo. Pretreatment of rats with antisense peptide nucleic acid targeted to galanin receptor type 1 mRNA abolished the effect of galnon, suggesting mediation of its anticonvulsant properties through this receptor subtype. These findings introduce a systemically active nonpeptide galanin agonist anticonvulsant. Saar K, Mazarati AM, Mahlapuu R, et al. Anticonvulsant activity of a nonpeptide galanin receptor agonist. Proc Natl Acad Sci USA. 2002;99(10):7136-41. Isolation and cDNA cloning of a novel galanin-like peptide (GALP) from porcine hypothalamus. Galanin is a widely distributed neuropeptide with a variety of physiological functions. Three galanin receptor subtypes, GALR1, GALR2, and GALR3, have been reported. We isolated a novel galanin-like peptide (GALP) from porcine hypothalamus by observing its activity for increasing [(35)S]GTPgammaS binding to a membrane preparation of GALR2-transfected cells. The peptide had 60 amino acid residues and a non-amidated C terminus. The amino acid sequence of GALP-(9-21) was completely identical to that of galanin-(1-13). A cloned porcine GALP cDNA indicated that GALP was processed from a 120-amino acid GALP precursor protein. 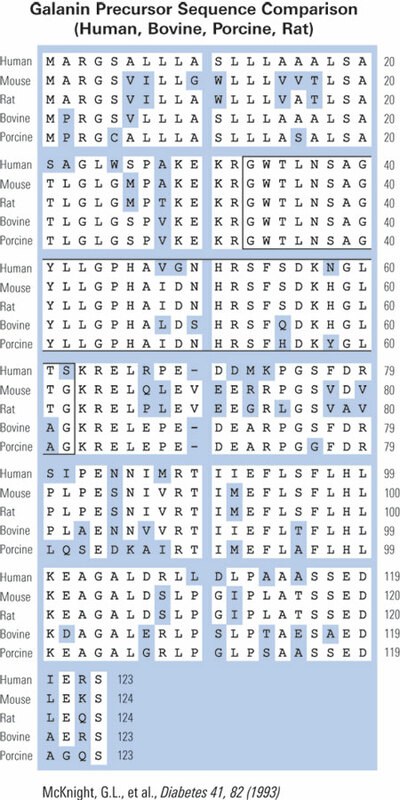 The structures of rat and human GALP-(1-60) were deduced from cloned cDNA, which indicated that the amino acid sequences 1-24 and 41-53 were highly conserved between humans, rats, and pigs. Receptor binding studies revealed that porcine GALP-(1-60) had a high affinity for the GALR2 receptor (IC(50) = 0.24 nM) and a lower affinity for the GALR1 receptor (IC(50) = 4.3 nM). In contrast, galanin showed high affinity for the GALR1 (IC(50) = 0.097 nM) and GALR2 receptors (IC(50) = 0.48 nM). GALP is therefore an endogenous ligand that preferentially binds the GALR2 receptor, whereas galanin is relatively non-selective. Ohtaki T, Kumano S, Ishibashi Y, et al. Isolation and cDNA cloning of a novel galanin-like peptide (GALP) from porcine hypothalamus. J Biol Chem. 1999;274(52):37041-5. Pharmacological and biochemical characterization of a recombinant human galanin GALR1 receptor: agonist character of chimeric galanin peptides. The galanin neuropeptide system is widely distributed throughout the brain and periphery and is thought to play a role in feeding, pain and reproduction. To evaluate the human galanin receptor 1 as a potential therapeutic target, we fully characterized its interaction with several galanin-like peptides. The human galanin receptor 1 receptor was stably expressed using an episomal system in human embryonic kidney 293E cells. Saturation isotherms using 125I-human galanin revealed two distinct populations of receptor affinity states in membranes and whole cells with picomolar and nanomolar affinities at the high- and low affinity states, respectively. A scintillation proximity assay revealed that 125I-human galanin binding in membranes reached steady-state within 2 to 2.5 hr; however, only 50% of galanin radiolabel dissociated from the receptors by excess galanin or guanosine 5'-O-3-thiotriphosphate even after 20 hr. In contrast, galanin binding in whole cells was completely reversible within 1 hr. Competition binding assays showed that galanin-like peptides bound with picomolar affinities in membranes and whole cells. These peptides behaved as full agonists as determined by the inhibition of forskolin-stimulated cyclic 3'5'-adenosine monophosphate production and the stimulation of guanosine 5'-O-(3-[35S]thiotriphosphate binding. The agonist profile of M40, a representative chimeric peptide, was found not to be the result of receptor reserve because receptor inactivation by partial alkylation experiments confirmed its full intrinsic efficacy under conditions of a "zero" reserve state. These observations suggest that the antagonist effects in vivo of M40, and perhaps other chimeric peptides, are not mediated via direct interactions with the galanin receptor 1 receptor. Fitzgerald LW, Patterson JP, Conklin DS, Horlick R, Largent BL. Pharmacological and biochemical characterization of a recombinant human galanin GALR1 receptor: agonist character of chimeric galanin peptides. J Pharmacol Exp Ther. 1998;287(2):448-56.